SYRACUSE — The state of the foundation was presented during the Wawasee Area Conservancy Foundation Annual Meeting Saturday. During the close to 90-minute meeting guests heard from several board members on projects and programs. Dr. Joan Szynal, chairman of the WACF Board of Directors, talks about the watershed. Dr. Joan Szynal, chairman of the WACF board, stated WACF is “all about clean water. 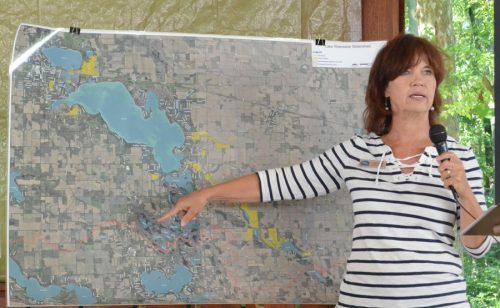 So everything we’re doing is about clean water.” She spoke about the watershed, why stabilization projects were needed, the importance of the three streams feeding into the lake, land acquisitions including the recently purchased 34 acres in Gordy Lake, education programs, ecology and other areas. Szynal also presented the shoreline award to Tom and Patty Kelly, Pier 800-801, on their installation of glacial rock and stone. “It is beautiful. I can’t tell you how important that is for the lake,” Szynal stated. The Kelly’s received a photograph of their home taken from the lake. Heather Harwood, executive director, spoke of past projects and several new projects. The new projects include work on the Turkey Creek Tributary and Martin Creek. Both projects will deal with reducing sediment into the lake. It is estimated the Turkey Creek project will prevent 430 tons of sediment entering the lake per year and 181 tons of sediment per year with the Martin Creek project. 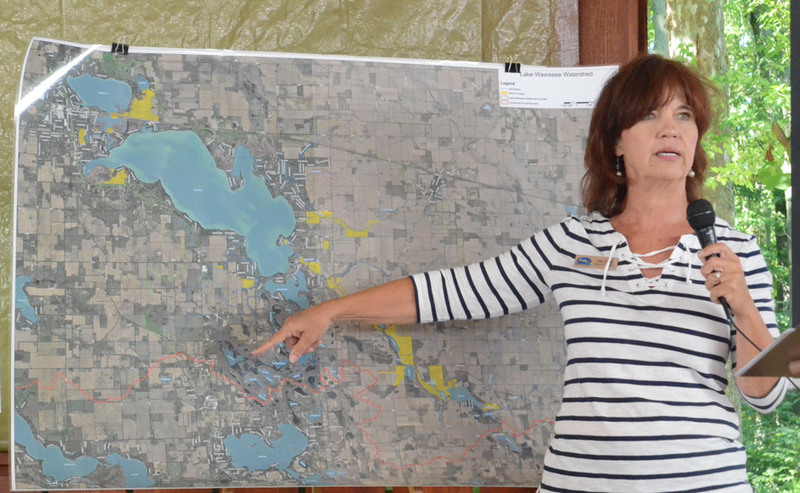 Harwood noted Martin, Dillon and Turkey Creek take up about 64 percent of the watershed area and supply about 60 percent of the water supply, having a big impact on the lake. Also noted was the invasive plant removal in the watershed and eco zones. She stated with the assistance of grants from the U.S. Fish and Wildlife, the educational facility now has three miles of trails. Mapping will be installed at the trail head in the next few months. 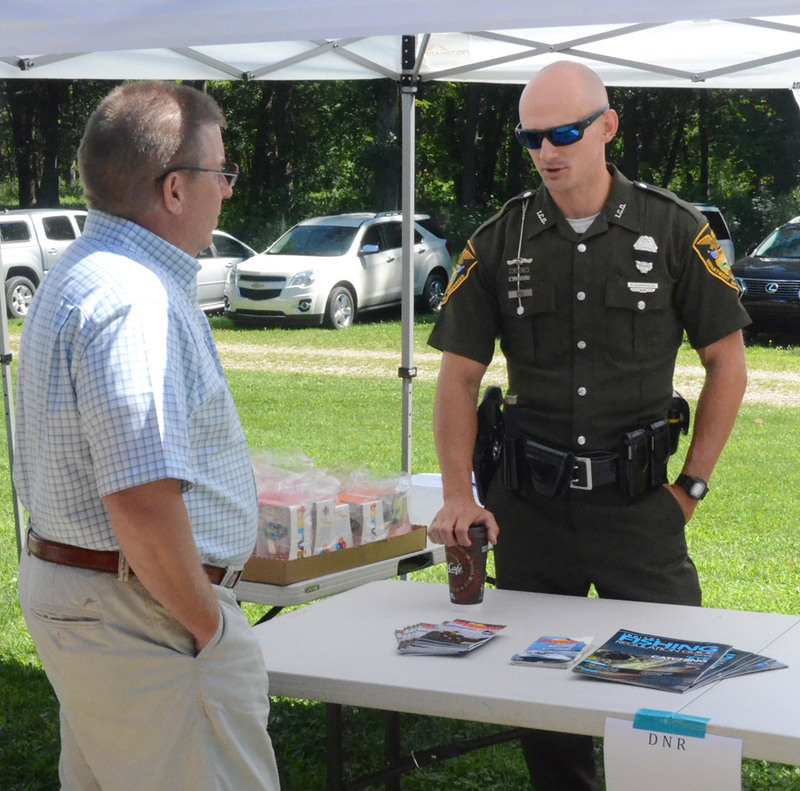 Jim Donahoe, Aquatic Weed Control, talks with Indiana Conservation Officer Nick Vandermolen. Jim Donahue, Aquatic Weed Control, presented a brief overview of the management of starry stonewort on the lake. Currently 238 acres of the invasive plant is in the lake. A more updated figure will be available after the August application to manage the plant. He did note that there is no way to eradicate the weed, at this time, you can only manage it. It was also noted the plant can now be found in 16 Indiana lakes. Pam Schumm, education committee, gave a sampling on programs offered since last year’s meeting. It was noted 2,275 people have been reached through these programs. “Our job is to educate for the present and future generations to enjoy life on the lake,” said Schumm. She noted 1,186 Wawasee School Corporation students in first, second, third, fourth, sixth and ninth grade participated in field trips to WACF. She also highlighted other programs such as Lake Talk and Eat, Wetland Adventures, Earth Day Festival, Discover the WACF, Falltastic walk, and canoe trips. Information about each program was given along with the number of participants. Dave Brandes presented a plea for funds. He commented it is “unbelievable how much money it takes” for projects, noting while grants are received, they are matching funds. He stated projects “cost a fortune,” and noted the $5 million campaign started four years ago. Brandes announced with one year to go in the capital campaign, $3.8 million has been raised. “We’d like to make the goal happen next year,” he said. He also announced due to a donation from Ron and Tami Baumgartner, the walkway from the educational building to the pavilion will be bricked. The Baumgartners donated brick removed from Milford streets, to WACF. 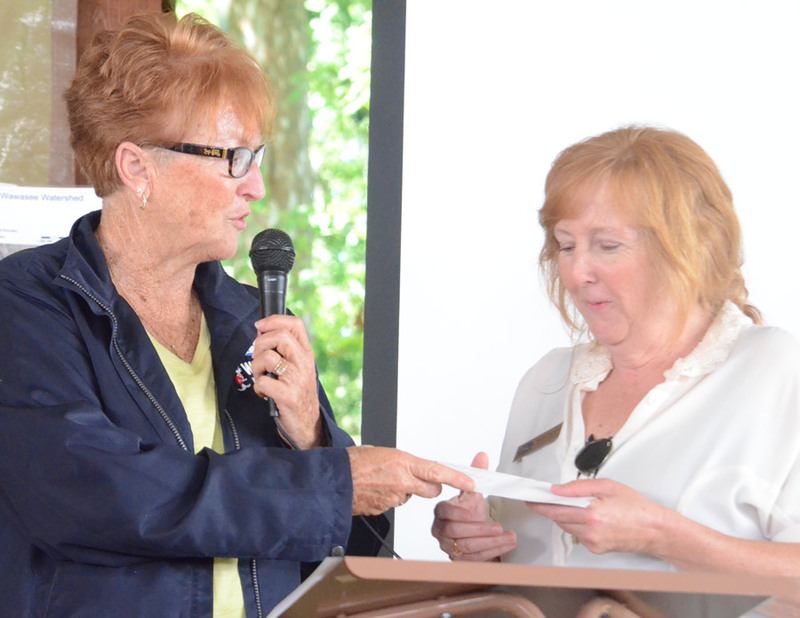 Kay Young, president of the Wawasee Property Owners Association, presents a $4,000 check to Heather Harwood, WACF Executive Director, to use for the Turkey Creek Tributary project. 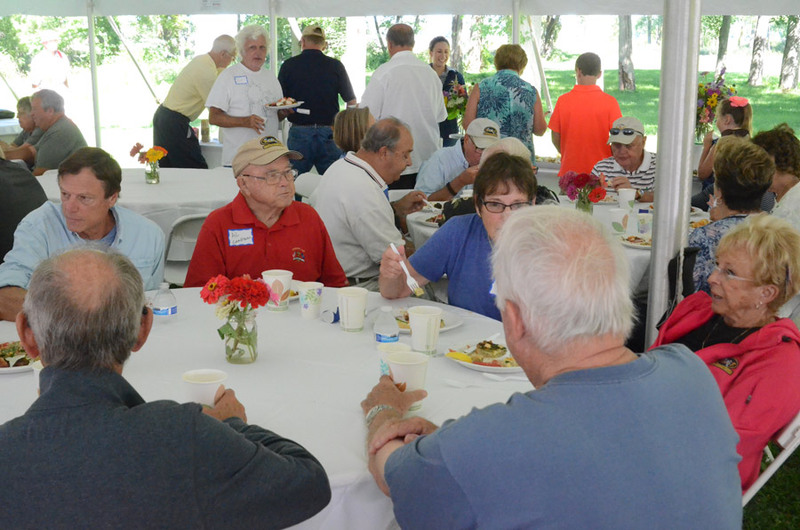 A brunch was enjoyed by the guests attending the Wawasee Area Conservancy Foundation Annual Meeting Saturday.